Welcome to Adweek's Super Bowl Ad Tracker for 2016, an up-to-date list of the brands running Super Bowl spots and the agencies involved in creating them. Leading up to game day on Feb. 7, CBS is reportedly holding back a handful of 30-second spots, priced "north of $5 million a spot," for brands hoping to make a late entrance into the Big Game. Overall, ad prices for this year's game have been up about 11 percent compared to 2015. Take a look below at all the news, organized by category. As game day approaches, we will continue to update the tracker and include the official ads and previews as they roll out, so be sure to check back regularly. Amazon's full spot is here. Taco Bell is unveiling the Quesalupa. GoPro has a regional ad in the Big Game. Fitbit will run its first Super Bowl spot this year. Shock Top released its final 30-second spot. Disney will promote The Jungle Book. Budweiser released its second game day spot. Paramount will advertise the new Teenage Mutant Ninja Turtles movie. Fiat Chrysler announced it has two spots running on Sunday. Pepsi released a spot starring Janelle Monáe. The NFL released another "No More" Super Bowl campaign. Toyota released a teaser featuring the Prius. Acura: Not seen during the Big Game since its 2012 spot starring Jerry Seinfeld, Acura confirmed it will return this year. The brand tapped Mullen Lowe L.A. to create the ad, while MediaVest is tasked with buying and Razorfish will handle digital responsibilities. No word on whether the brand will run a 30-second or 60-second spot, but the ad will run during the first quarter and will debut the new NSX supercar. UPDATE: Acura's full ad is now live. Audi: The automaker is back for its eighth Super Bowl appearance with a spot featuring the 2017 Audi R8 V10 Plus. The ad, from Venables Bell & Partners, features David Bowie's "Starman" and tells the story of a retired astronaut and his son. The brand released a 90-second version of the spot, but will air a 60-second cut on game day. Check out the full ad below. Buick: After sitting out in 2015, General Motors will make its return to the Super Bowl this year with an ad for Buick, according to Automotive News. The 30-second spot, from Leo Burnett Detroit, will be Buick's first for the Big Game and will focus on the Cascada convertible. New York Giants wide receiver Odell Beckham Jr. and actress Emily Ratajkowski will star in the ad. Fiat Chrysler: The automaker announced it will run two commercials during Sunday's game. The first spot is slated to run after the halftime show, and the second will air during the fourth quarter. Honda: Choosing to sit on the sidelines during last year's game, Honda announced it will return for Super Bowl 50. The brand tapped longtime agency partner RPA (which created 2012's Ferris Bueller reboot for the CR-V) to create the 60-second spot, which will run during the third quarter and focus on the 2017 Ridgeline pickup truck. UPDATE: Honda released its full Super Bowl ad, which stars a pack of singing sheep. Hyundai: In its first year as an official NFL sponsor, the frequent Super Bowl advertiser will run two 30-second spots during the first half, one 60-second spot ahead of kickoff and an additional 60-second ad during the pregame show. Innocean Worldwide, Hyundai's agency of record, will develop all of the creative. The brand also tapped three all-star directors to create the spots. Kevin Hart will star in the brand's pre-kick ad, "First Date," and Ryan Reynolds will star in one in-game ad, titled "Ryanville." UPDATE: Hyundai's two in-game ads are live. Kia: On the heels of its successful 2015 spot starring Pierce Brosnan, David&Goliath will create another spot for the car brand this year, the agency's managing partner and chief digital officer, Mike Geiger, confirmed to Adweek. Kia revealed that Christopher Walken will star in the ad alongside a colorful sock puppet. The automaker rolled out a teaser for the ad, "Walken Closet," featuring Walken in a walk-in closet. UPDATE: Check out Christopher Walken in Kia's full Super Bowl spot. MINI USA: BMW's brand confirmed it will run a Super Bowl spot during the third quarter this year, created by Butler, Shine, Stern & Partners. The campaign, titled "Defy Labels," will star six famous faces including Serena Williams, Abby Wambach, T-Pain, Randy Johnson, Tony Hawk and Harvey Keitel, according to The New York Times. Leading up to the Big Game, the brand will release six long-form interviews with the stars of the campaign. UPDATE: The full ad is now live. Toyota: For the fourth consecutive year, Toyota will return to the Super Bowl with a 90-second spot created by Saatchi & Saatchi L.A. for the Prius. Last year, the automaker ran two 60-second spots during the Big Game—including one starring Paralympic snowboarder Amy Purdy. The automaker released a teaser for its game-day ad, featuring a normal man, riding around town in his Prius, singing a song titled "Heck on Wheels." WeatherTech: The automotive floor mat company will run its third consecutive Super Bowl spot, created by Pinnacle Advertising. The 30-second commercial, called "Resources," will appear during the first half of the game. UPDATE: WeatherTech's game-day spot, "Resources," is live. Avocados From Mexico: Following up on its 2015 surprise hit, "First Draft Ever," which was also the brand's first Super Bowl spot, Avocados From Mexico announced it would be back for another round in 2016. GSD&M will again craft the ad, and Havas Media will handle buying. This year's spot, for which it released a short teaser, sends avocados to space with actor Scott Baio. Avocado lovers can follow the journey at www.AvosInSpace.com. UPDATE: The brand's futuristic spot is now live. Bai: The low-calorie beverage brand announced it will make its Super Bowl debut this year. Barton F. Graf will handle the creative for the 30-second spot, while Maxus will handle media. The ad will be a continuation of the brand's current "None of This Makes Sense" campaign, which launched last year. Budweiser: The cuddly puppy featured in two previous Super Bowl spots will not make a comeback for the Anheuser-Busch InBev brand this year. The iconic Clydesdales, however, will make an appearance. All told, A-B InBev plans to advertise Budweiser, Bud Light, Shock Top and Michelob Ultra in its mix of Super Bowl ads. The company purchased three minutes of air time this year. UPDATE: One of Budweiser's full ads is live. Helen Mirren stars in the 60-second spot, which hopes to combat drunken driving. The beer brand has second in-game spot, which features the iconic Clydesdales. Bud Light: The beer brand has rolled a 30-second teaser for its politically- themed Super Bowl spot. Created by Wieden + Kennedy, the ad stars Amy Schumer and Seth Rogen and is part of a larger Bud Light campaign that introduces the tagline, "Raise one to right now." UPDATE: Bud Light's patriotic spot is live. Michelob Ultra: Anheuser Busch's Michelob Ultra will run its 30-second spot in the first ad slot after kickoff on Sunday. The spot, created by FCB in Chicago, shows a montage of athletes who can all enjoy a Michelob Ultra because it's low in calories and in carbs. Shock Top: The AB InBev brand, running its first Super Bowl ad this year, released a 90-second teaser announcing that T.J. Miller will star in the game day spot. The brand released a 90-second spot, which will be cut down to a 30-second ad for game day. UPDATE: The final cut of Shock Top's Super Bowl spot is live. Coca-Cola: The brand confirmed to Adweek that it will run a 60-second ad during the second quarter. Coke will partner with Marvel for the spot. Butterfinger: Nestlé deployed a professional skydiver—who safely completed a 12,000-foot jump—to announce Butterfinger's return to the Big Game. The brand, which ran its first Super Bowl spot in 2014 to promote its new Butterfinger Peanut Butter Cups, did not return in 2015. WPP's Santo will create the new 30-second spot, which will air in the third quarter. For the second phase of its campaign, Butterfinger pledged to cover up to $50,000 in excessive celebration fines for the conference championship games and Super Bowl 50. Check out the brand's teaser below. Doritos: This year marks the 10th and final year of the brand's "Crash the Super Bowl" campaign. The PepsiCo brand will give contestants a chance to win $1 million and work with Man of Steel and 300 director Zack Snyder. The three finalists this year feature an expectant mother and a sonogram, three dogs hungry for Doritos and an avid Tinder swiper. Kraft Heinz: Last seen at the Big Game in 2014, Heinz Ketchup will return this year with a 30-second spot for the brand's #MeettheKetchups campaign. David Miami will handle creative for the ad. UPDATE: The brand released its full ad, which features an adorable stampede of weiner dogs. Mountain Dew: The PepsiCo brand will run its first Super Bowl spot since 2000 in a campaign that will push the Mtn Dew Kickstart beverages. BBDO New York will handle the creative. The brand released two teasers on its social media channels featuring a very furry baby. UPDATE: The ad, which features a "Puppymonkeybaby," is here. Pepsi: Once again Pepsi will sponsor the Super Bowl halftime show, with performances by Coldplay and Beyoncé. In preparation for the halftime show, Pepsi launched "Camp Halftime," an online video series starring Donald Faison. The brand will roll out a new episode every Wednesday leading up to the Big Game. UPDATE: Pepsi will air "The Joy of Dance," staring Janelle Monáe, just before the halftime show kicks off. Skittles: The candy brand will return this year following its popular 2015 spot that featured two men arm wrestling for the last lemon-flavored candy. DDB Chicago was once again tasked with creating this year's spot. Skittles released a two-second teaser GIF announcing Steven Tyler will appear in the ad. UPDATE: The brand's full ad with Tyler is now live. Snickers: On the heels of the highly successful Brady Bunch-themed ad from BBDO in New York starring Danny Trejo, parent company Mars confirmed Snickers will have another run during Super Bowl 50. BBDO will handle creative work again this year and has a lot to live up to, with Adweek naming the Brady Bunch spot one of 2015's Ads of the Year. The brand's teaser features a hungry Marilyn Monroe singing "Happy Birthday" in honor of 50 years of the Super Bowl. UPDATE: Willem Dafoe does his best Marilyn Monroe impersonation in the brand's full ad. Taco Bell: The fast-food chain will return to the Super Bowl after sitting out for two years, with a 30-second spot by Deutsch L.A. To announce its return, the brand released a comically redacted press release offering sparse details about the spot and a mysterious new product. Some are speculating Taco Bell's mysterious new product will be the Quesalupa, a chalupa with a cheese-filled shell. The brand then released a cryptic teaser starring NBA player James Harden. The ad is still such a big secret that even Harden said he doesn't know what he's selling. Mobile Strike: Arnold Schwarzenegger stars in Machine Zone's ad for mobile game Mobile Strike. The gaming company released a 60-second teaser for the ad, both of which were created by twofifteenmccann. Pokémon: In honor of its 20th anniversary, Pokémon will run an ad during Super Bowl 50. The brand has not revealed much about the campaign yet, but said it will encourage viewers to "Train On." UPDATE: The brand's full 30-second spot, created by Omelet in Los Angeles, is now live. Intuit: Finance and tax software creator Intuit will once again give up its 30-second Super Bowl spot to one of three small business finalists in its "Small Business, Big Game" competition. RPA will produce the winning spot for Chubbies Shorts, Death Wish Coffee or Vidler's 5 & 10. UPDATE: Intuit named Death Wish Coffee Co. the winner for this year's contest. The final spot for the coffee brand, below, will air during the third quarter. SoFi: Financial services company SoFi, another Super Bowl newcomer, released its full 30-second spot ahead of game day. Created by agency Muh-tay-zik Hof-fer, the campaign is designed to introduce the company to the world and encourages people to live in a "bankless world." UPDATE: The brand released an updated version of its final ad. SoFi cut out the final line from the original game-day spot, which told people they probably weren't great. SunTrust Banks: This year, SunTrust Banks will run its first Super Bowl spot, created by New York agency StrawberryFrog. The brand believes its 30-second ad will fare well during the Big Game this year as Americans become more optimistic about their personal finances. UPDATE: The full ad is live. TurboTax: As parent company Intuit continues its small business competition, TurboTax will make its third consecutive Super Bowl appearance this year. Wieden + Kennedy will create the spot, titled "Genius," following the brand's "Boston Tea Party" ad from 2015. James Lipton is featued in a 60-second teaser for the brand. Quicken Loans: Online mortgage lender Quicken Loans released its first Super Bowl ad, touting the brand's Rocket Mortgage app. Fallon in Minneapolis created the 60-second spot, which will run during the first half on Feb. 7. The ad is part of the brand's larger "Push Button, Get Mortgage" campaign. Disney: Disney may have a few trailers running on Sunday, but one confirmed trailer will be for the upcoming live-action version of The Jungle Book. Paramount Pictures: Movie studio Paramount will promote Teenage Mutant Ninja Turtles: Out of the Shadows, debuting on June 3, during the Big Game, according to a report from The Hollywood Reporter. Amazon: Alec Baldwin and Dan Marino will star in Amazon's first Super Bowl spot this year, created by Leo Burnett Toronto. A teaser for the ad shows the two men using the Amazon Echo voice command product to plan their game-day party. The brand released a second teaser and announced that Missy Elliot will be featured in the final spot. UPDATE: Amazon's full spot, which features a guest appearance from Jason Schwartzman, is now live. Apartments.com: Jeff Goldblum and Lil Wayne teamed up with Apartments.com for the brand's Super Bowl campaign. RPA created the 60-second ad titled "MovinOnUp," slated to run during the second commercial break. The brand released a second teaser, featuring Lil Wayne and George Washington. UPDATE: Check out Jeff Goldblum singing in the full Apartments.com commercial. Squarespace: Last year, Jeff Bridges made headlines for his role in the digital publishing platform's second Super Bowl spot—he even helped create a 15-track meditation and sounds album for the campaign. Squarespace plans to return this year, tapping lead agency Anomaly to create the ad. Comedy duo Keegan-Michael Kelly and Jordan Peele, or Key & Peele, will star in this year's spot. Outside of starring in the brand's ad, the pair will also do live video commentary during the entire game for Squarespace. UPDATE: The full ad with Key & Peele is here. Wix: After making its Super Bowl debut last year with a star-studded cast including Terrell Owens and Brett Favre, the website development company decided to return in 2016. The Tel Aviv-based company selected DreamWorks Animation to produce the 30-second spot. Wix released a 20-second teaser, featuring characters from the upcoming DreamWorks film Kung Fu Panda 3. The brand will release three additional teasers before airing its final Super Bowl spot on Feb. 7. UPDATE: Check out Po and the gang from Kung Fu Panda in Wix.com's full ad. Axe: With the success of its recent "Find Your Magic" campaign, Axe announced it will run a 30-second version of the ad on Super Bowl Sunday. 72andSunny in Amsterdam created the original 60-second spot, which launched two weeks ago. Colgate: The toothpaste brand will make its Super Bowl debut in 2016, with a 30-second spot titled "Save Water." The ad, which will run at the two-minute warning break during the second half, will encourage people to turn the tap off while brushing their teeth in an effort to save water. UPDATE: The 30-second spot is live. Schick: The Edgewell Personal Care razor brand will run a 30-second spot, created by J. Walter Thompson, during the game. The ad promotes the new Schick Hydro 5 razor and features two razors turning into battling robots. Marmot: The outdoor apparel brand will run its first Super Bowl spot this year and released three short teasers ahead of game day. Goodby, Silverstein & Partners will handle creative for the ad, which will feature the brand's new marmot mascot enjoying the great outdoors. Fitbit: The wearable tech company announced it will run its first Super Bowl spot this year. Argonaut handled the creative for the ad, "Get Fit in Style," which focuses on the Fitbit Blaze. GoPro: The brand announced it will run a regional Super Bowl commercial for the second year in a row. It will air in Chicago, Los Angeles, Minneapolis, New York, San Diego, San Francisco and Seattle. The 30-second spot is set to "Blitzkrieg Bop" by the Ramones. LG Electronics: Not only is the brand running its first Super Bowl spot, but it's also bringing director Ridley Scott back to the Big Game, this time as a producer. The last time Scott participated in the event was when he created Apple's legendary "1984" ad. RSA Productions will produce the 30-second spot, and Jake Scott will direct. The brand released a teaser revealing that Liam Neeson will star in the spot. PayPal: Another Super Bowl first-timer, PayPal announced Crispin Porter + Bogusky will create its 45-second commercial for the first quarter. UPDATE: The brand's first Super Bowl spot is now live. T-Mobile: The wireless carrier will run a 30-second spot during the Big Game. Created by Publicis Seattle, the ad stars rapper Drake and spoofs his song "Hotline Bling." UPDATE: After letting fans vote on Twitter, the brand decided to air a 60-second version of Drake's Super Bowl spot. NFL: Last year the NFL addressed domestic violence during the Super Bowl. This year the organization is taking a lighter approach with its marketing. The league released a music video, from Grey New York, featuring a few generations of Super Bowl babies singing Seal's "Kiss from a Rose." A 60-second version will air on game day. The NFL has a second spot running Sunday as part of the larger "No More" campaign, which tackles domestic violence and sexual assault. The 30-second ad from Grey New York is slated to run during the third quarter. It uses a text exchange between two friends to highlight signs of possible domestic violence. GoDaddy: After pulling a controversial spot last year featuring a golden retriever puppy that gets sold and replacing it with a last-minute spot, Web domain company GoDaddy announced it will sit out Super Bowl 50. This will be the first time in 12 years the brand won't have an ad on game day. Nationwide: After receiving backlash last year for running a Super Bowl ad about a dead kid, Nationwide confirmed to Adweek that it will sit out of the Big Game this year. "We are not advertising in the 2016 Super Bowl. Nationwide has historically been selective in our marketing approach around the Super Bowl. This year, we are focused on increasing our support of the Walter Payton Man of the Year Award and supporting the players making a positive impact in their communities," the brand told Adweek. Nissan: While Nissan made its first Big Game appearance since 1997 during last year's Super Bowl, the car brand told Automotive News it plans to sit this year's game out. Mercedes-Benz: The car brand made a rare appearance during last year's game with a 60-second ad retelling the story of The Tortoise and the Hare, but Automotive News confirmed the brand won't return this year. 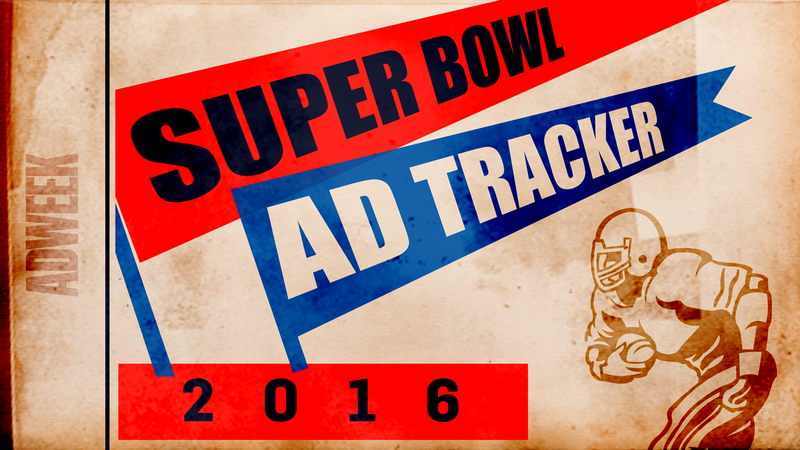 See anything we missed or got a tip on a Super Bowl ad, celebrity cameo or brewing controversy that's not yet in the Super Bowl Ad Tracker? Drop an email to Adweek staff writer Katie Richards.